Discipline and Punish: The Birth of the Prison is a book written by the philosopher Michel Foucault. Originally published in 1975 in France under the title Surveiller et punir: Naissance de la Prison, it was translated into English in 1977. It is an examination of the social and theoretical mechanisms behind the massive changes that occurred in western penal systems during the modern age. 1977-02-05. New. Ships with Tracking Number! INTERNATIONAL WORLDWIDE Shipping available. Buy with confidence, excellent customer service! 1979-02-05. New. Ships with Tracking Number! INTERNATIONAL WORLDWIDE Shipping available. Buy with confidence, excellent customer service! London: Allen Lane, 1977 In this brilliant work, the most influential philosopher since Sartre suggests that such vaunted reforms as the abolition of torture and the emergence of the modern penitentiary have merely shifted the focus of punishment from the prisoner's body to his soul. Translated by Allan Sheridan.. First Edition. Hardcover. New/New. 8vo - over 7¾" - 9¾" tall. Pantheon Books. Hardcover. 0394499425 New Condition. . New. Pantheon Books. Hardcover. 0394499425 Like New Condition. . Fine. Pantheon Books, 1977-01-01. First American Edition. Hardcover. Used:Good. 1991-09-01. New. Ships with Tracking Number! INTERNATIONAL WORLDWIDE Shipping available. Buy with confidence, excellent customer service! 1977-02-05. Good. Ships with Tracking Number! INTERNATIONAL WORLDWIDE Shipping available. May not contain Access Codes or Supplements. May be ex-library. Shipping & Handling by region. Buy with confidence, excellent customer service! Gardners Books. PAPERBACK. 014013722X New Condition. . New. Vintage. PAPERBACK. 0394727673 New Condition. . New. Gardners Books. PAPERBACK. 014013722X Like New Condition. . Fine. Pantheon Books, 1977-01-01. Hardcover. Good. 8.8000 inches 5.8000 inches. Cover/edges are worn and or have small tears, otherwise good reading copy. Damage on front cover. Damage to spine. Ex-library copy with usual markings. Stated First American Edition. 1991-09-01. Good. Ships with Tracking Number! INTERNATIONAL WORLDWIDE Shipping available. May not contain Access Codes or Supplements. May be ex-library. Shipping & Handling by region. Buy with confidence, excellent customer service! Vintage Books. PAPERBACK. 0679752552 . New. 2014. 1979-02-05. Good. Ships with Tracking Number! INTERNATIONAL WORLDWIDE Shipping available. May not contain Access Codes or Supplements. May be ex-library. Shipping & Handling by region. Buy with confidence, excellent customer service! VINTAGE. New. 8.02 x 5.21 cm. Vintage. PAPERBACK. 0394727673 Like New Condition. . Fine. Tantor Audio. MP3 CD. 1452665567 Special order direct from the distributor . New. NEW YORK NY: VINTAGE BOOKS/RANDOM HOUSE. FINE IN WRAPS. PUB 1978. PAPERBACK. ISBN: LATER PRINTING OF THE SECOND VINTAGE BOOKS EDITION OF MAY 1995. ISBN: TRANSLATED FROM THE FRENCH BY ALAN SHERIDAN. BOOK IS FINE WITHOUT ANY MARKS TO THE BINDING OR THE TEXT. ANEXCELLENT CLEAN AND UNMARKED COPY.. Keywords: PHILOSOPHY, ABCDEF. England: Penguin, 1979. Reprint. Paperback. Fine. Fine condition. 333 pages with no Index. clean no remarks or highlights inside. We can ship from the USA and Canada. We list books that are academic, collectible and historically significant, providing the utmost quality and customer service satisfaction. For any questions feel free to email us. Tantor Audio. MP3 CD. 1452665567 disc(s) free of scratches and plays great, light wear to case, ships same day or next . Very Good. Gardners Books. PAPERBACK. 014013722X Brand New ,Original Book , Direct from Source , Express 5-8 Business days worldwide Delivery. . New. Vintage Books, 2007-01-01. Paperback. Used:Good. Vintage, 1995-04-25. 2nd Edition. Paperback. Used:Good. Vintage Books. PAPERBACK. 0679752552 New book. . New. 1995. Vintage Books. PAPERBACK. 0679752552 Special order direct from the distributor . New. Vintage Books, 2007-01-01. Paperback. Good. Vintage Books. PAPERBACK. 0679752552 . New. Vintage Books. PAPERBACK. 0679752552 Remainder mark . Fine. Paperback. New. Foucault shows the development of the Western system of prisons, police organizations, administrative and legal hierarchies for social control - and the growth of disciplinary society as a whole. Gardners Books. PAPERBACK. 014013722X . New. Gardners Books. PAPERBACK. 014013722X Item in good condition.No Marking.Covers could be Little damaged . Textbooks may not include supplemental items i.e. CDs, access codes etc.. . Very Good. Pantheon Books, 1977. Hardcover. Good. Gardners Books. Used - Good. Good condition. Writing inside. Vintage, 1995. Soft Cover. Very Good. No markings. Light wear to the cover. Translated by Alan Sheridan. 333 pages. Vintage Books. PAPERBACK. 0679752552 *LIKE NEW* Ships Same Day or Next! . Fine. Vintage Books. PAPERBACK. 0679752552 *BRAND NEW* Ships Same Day or Next! . New. Used paperback in very good condition. General wear to cover and corners. Text free from internal markings. New York: Vintage Books. Reprint. Trade paperback. Light shelfwear. Very good. ix + 215pp., translated from the French by Alan Sheridan, translator's note, notes, biblio. 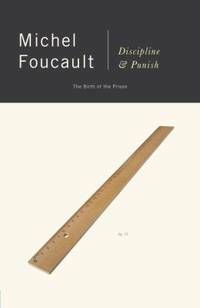 In this brilliant work, the most influential philosopher since Sartre suggests that such vaunted reforms as the abolition of torture and the emergence of the modern penitentiary have merely shifted the focus of punishment from the prisoner's body to his soul. Vintage. Used - Like New. 1995. 2nd. Paperback. Small Publisher's Mark To Text Block. Otherwise, Fine. Vintage Books. PAPERBACK. 0679752552 SHIPS NEXT BUSINESS DAY. NO WRITING OR HIGHLIGHTING NO RIPS IN COVER LIGHT WEAR. OUR PROCESS NOW ALLOWS FOR 3 PEOPLE TO INSPECT YOUR BOOK BEFORE IT SHIPS ENSURING AN ACCURATE DESCRIPTION. THANK YOU FOR HELPING US CELEBRATE OUR 12th YEAR IN THE BOOK INDUSTRY. . Very Good. Vintage Books. PAPERBACK. 0679752552 BRAND NEW, GIFT QUALITY! NOT OVERSTOCKS OR MARKED UP REMAINDERS! DIRECT FROM THE PUBLISHER!|0.55 . New. Vintage Books, 1995. Paperback. Acceptable. Disclaimer:A readable copy. All pages are intact, and the cover is intact. Pages can include considerable notes-in pen or highlighter-but the notes cannot obscure the text. An ex-library book and may have standard library stamps and/or stickers. At ThriftBooks, our motto is: Read More, Spend Less.Dust jacket quality is not guaranteed.